A superb pair of early 19th century mahogany window seats. The backs of the window seats consist of a shaped top rail with carved gadroon decoration to the centre with a moulded panel below and moulded uprights to either side, leading down to a back splat with central circular turned patera and scrolling foliate decoration to either side. 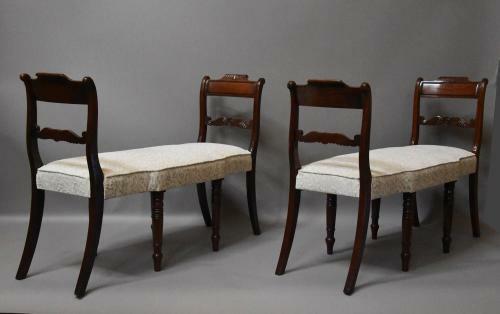 The seats are upholstered in a natural fabric which could easily be replaced once purchased, each of the window seats having eight legs, these being sabre outer legs and turned inner legs. The rails have been replaced, possibly due to damage or a conversion at some time, the backs and legs being original and dating from around 1820. These seats are in very good condition for age, are of stable construction and can go straight into a home.